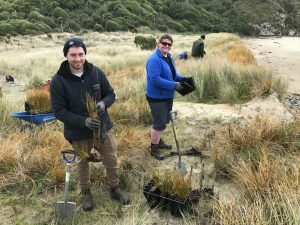 The Trust’s extensive habitat conservation programme has seen numerous native trees and shrubs planted to provide habitat for hoiho. Native vegetation provides shade and privacy for penguins whilst they are nesting, roosting or moulting on land. Planting has additional benefits for the wider ecosystem including erosion control, offsetting climate change, improving stream quality and providing habitat for other land animals (e.g. insects, lizards and forest birds) and marine birds (e.g. petrels and tītī). Nest boxes have also been added at various reserves to provide additional nesting opportunities, particularly in places where there is no understory to provide privacy for hoiho or where trees are slow to grow.